Sword of the Spirit – LDS Activity Days Ideas! I didn’t know anything about sword fighting before I planned out this Activity Days activity, so even if you don’t know the first thing about sword fighting, this plan should prepare you! It starts with a discussion of the Armor of God (with an emphasis on the Sword of Faith), then you learn how to make “boffer” swords (padded swords used in practice fighting), and then learn some very basic sword technique. If you’re short on money, you could also just use similar size sticks/dowels for practice, being VERY strict about safety while practicing since they are not padded. The boffers cost between $1.25 and $2.00 to make, depending on if you use the cheap, large rolls of duct tape, or the colorful kind. Category: Developing Talents, Living and Learning the Gospel. 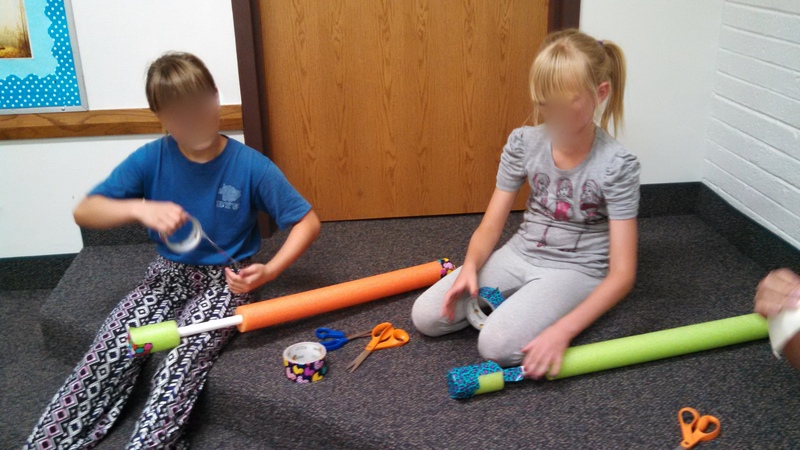 28 inches of pool noodle for each girl – one length of 24 inches and one length of 4 inches. If you have more than a handful of girls, make sure to reserve the gym or claim an outdoor space where you can spread out for sword fighting. Purchase the pool noodles first. I bought mine at the dollar store and they were nearly four feet long. My plan was to make 12, so this means seven pool noodles – six to cut in half, and one to cut into 12 pieces, each just four inches long. 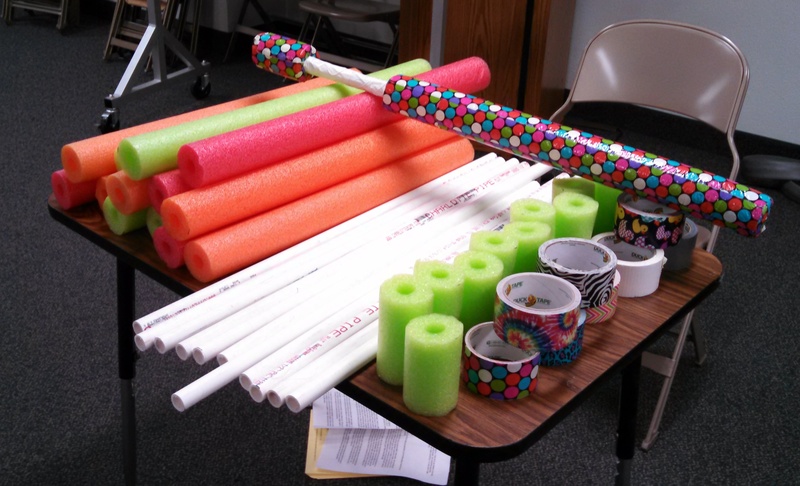 Take one of the pool noodles with you to purchase the PVC pipe. Use it as a guide to determine which thickness you need. My pool noodles from the dollar store required 1/2″ PVC, but many pool noodles have 3/4″ holes instead. The pool noodle should slide on somewhat easily but snugly. 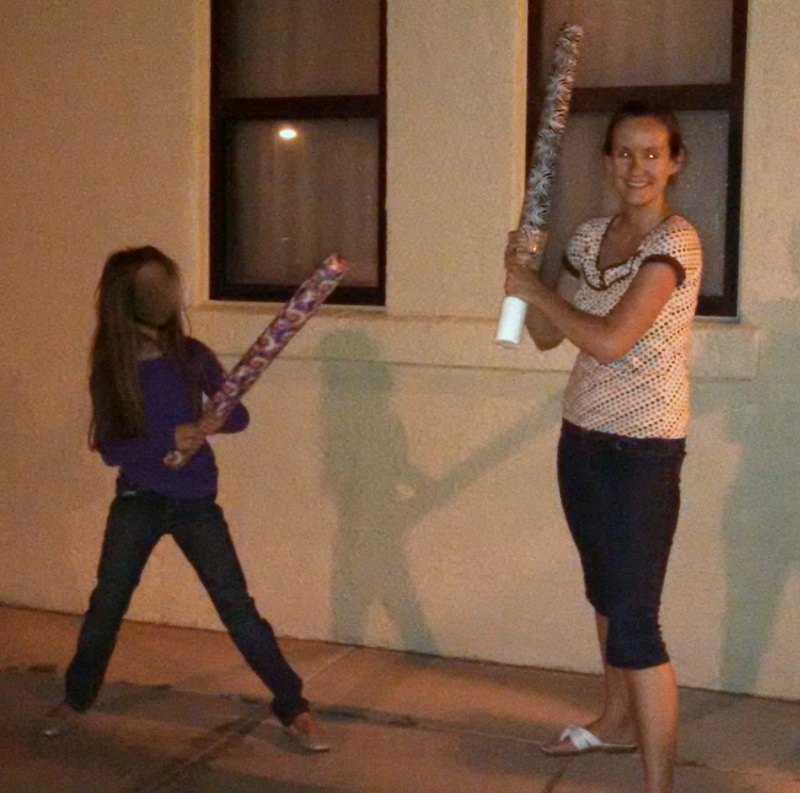 PVC pipe usually comes in ten foot lengths, so to make 12 swords I bought 3 lengths. 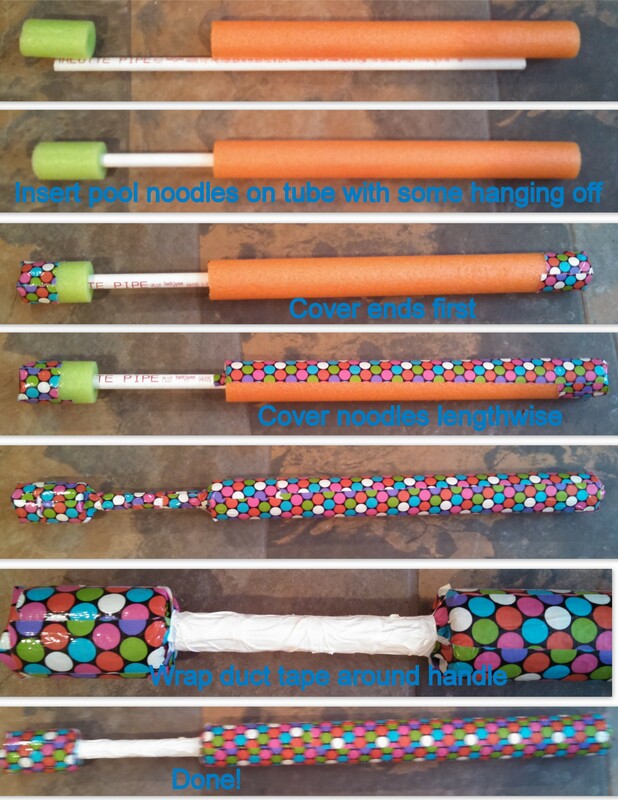 Cut the pool noodles and PVC pipe in advance (each girl will get one 24″ length of noodle, one 4″ length of noodle, and one 30″ length of pipe). You will need a saw for the pipe but regular scissors or a serrated knife work fine for the pool noodles. 1. Read Ephesians 6: 11-18 together and briefly discuss each piece of armor (you may also want to use a handout). How does the Word of God help us use the Sword of the Spirit? How can the Spirit and the Word of God help us in the fight against evil? 1. To learn how to make a boffer sword I used this instructional. It is for a bit bigger sword but if you can’t understand my instructions it will provide you with a second source. I made my swords smaller to reduce waste and cost, and also because the swords are being made for kids not full grown adults. 2. Hand each girl their supplies. Have them work in pairs/triplets (depending on how many rolls of duct tape you have) to help each other do one sword at a time. 3. Slide the little noodle halfway on one end (so two inches of the noodle should be on the PVC, two inches hanging off – you can just use your thumb to measure – exact measurements are not important here). Slide the big noodle onto the other end with about four inches hanging off (length of a middle finger for this one). You should be left with about eight inches of exposed PVC where the “handle” of the sword is. 5. 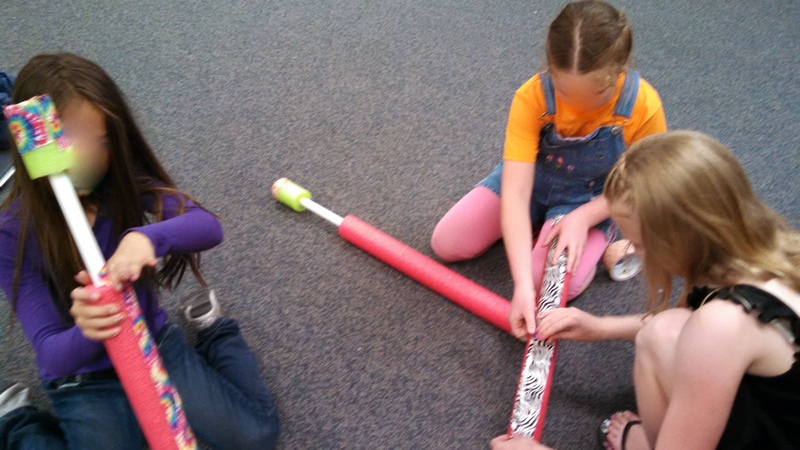 When the piece of tape reaches the sword, make sure an inch or two goes on the PVC pipe. It will get wrinkly here but that’s okay. Finally, wrap tape around the handle (this is the only place where it’s okay to wrap around instead of going lengthwise. Wrap as close to the foam as possible so you tape over the end of the duct tape pieces from when you were doing the foam (otherwise these ends might come loose). Of course you can use the same color tape – I just used a different color so you could see more easily. You’re done! 1. Head to the gym or open outside area to learn sword fighting. 2. Safety – because no one is wearing armor they need to use LIGHT touches with NO head contact. Even with armor, those practicing sword fighting use a light touch because “learning the moves” doesn’t require you to hurt the other person. Once the opponent feels your “blow” they will react the same in practice whether you hit them soft or hard – so use a light touch. 3. Starting/stopping: The term for starting a practice fight in “Lay On.” When you both say “lay on,” that means you are both ready to begin. At ANY time, either person or even someone in the audience can say “Hold” to stop the fighting. You can “hold” if you’re tired, injured, just need a break, need to talk, or you notice a safety issue, or for ANY reason. “Hold” means immediately stop and back away from the fight. If your opponent manages to touch your vitals with the tip of her sword (even a light touch!) you are dead and fall to the ground. If she manages to touch any of your limbs with either the tip OR edge of her sword, you can no longer use that limb but can continue fighting. 4. Have them practice starting and stopping with a partner, with whatever “play fighting” technique they are used to. It’s great to start off with having them do a minute or two of “unskilled” fighting so that when they learn the proper technique you can contrast it to what they were doing before. 5. Holding the sword – You are practicing two-handed sword fighting today, which is a little different than fighting with a shield. It means less protection because you have no shield, but you have more strength and power in your blows because you are holding the sword with both hands. Show them how to hold their sword with the weaker hand at the bottom of the handle, and their stronger/dominant hand either at the top of the handle or the bottom of the blade (this is a called “half-swording”). Have them try both positions and decide which is more comfortable for them. It seems weird to have part of your hand on the blade, but in medieval times they actually only sharpened the top 3-5 inches of the blade. The rest was about as sharp as the tip of a screwdriver – perfectly fine for holding. Finally, the tip of the sword should be pointed toward the opponent’s heart or head. 6. Arms – Point out that in this position, their arms are protecting their vital organs. Holding the sword too low or too high (or with only one hand) leaves them more vulnerable to a fatal attack. You may want to contrast this with how you saw them holding the sword in #4 (play fighting). 7. Legs and Feet – If your feet are too close together, it’s easy to fall over. If they are too far apart, it’s harder to move around. So, keep your feet about shoulder length apart, knees bent. It’s harder to hit a moving target, so do a lot of side-to-side movement. 8. Distance – You need to be close enough to stab your opponent, but not so close that they can kick you. In practice you should never be closer than an arm’s length at the closest, to avoid injury. Before fighting it’s okay to tap your opponent’s shoulder with the tip of your sword to see that you are at the right distance. 9. Have the girls practice these things before moving on. Their are to pay attention to how they hold the sword, their leg/feet position, being a moving target, and maintaining appropriate distance. (Remind them to use “lay on” and “hold” while practicing.) You may want to rotate every few minutes to give them new opponents. 1. After a water break, come back together and tell them you’re finally going to teach them a few “moves” with their sword. 2. Slashing – this is usually what you see in a sword fight in the movies – the swordsman will slash side-to-side or up and down, and if they hit their opponent it results in a long cut. This is probably also how you usually play fight with your sword. In reality, it is not the best move you can make, especially if your opponent is wearing armor. A slashing move will just glance off of their armor without injuring. Even if they aren’t wearing armor and you hit them with a slash, the cut often isn’t deep enough to really injure them, just make them bleed a little. 3. Thrusting – also known as “stabbing,” this is the most powerful move you have because it is more often fatal, and is more likely to pierce through any armor. Because knights knew that stabbing was the way to go, and it was often immediately fatal, most sword fights usually only lasted about 30 seconds – much shorter than the sword fights in the movies! The trick with thrusting is that you need to find an opportunity to thrust at your opponent without exposing your body to injury – especially your vitals! Using your sword to prevent a thrust from hitting you is called deflecting. 4. Things to Avoid – Anything that exposes your vital organs (like raising your sword about your head) or points the tip of your sword away from your opponent (like big slashing moves) are a bad idea. Also, a common saying in sword technique is “When you swing, know why.” This means that moving your sword around for no reason wastes your energy and also puts you at risk. So, don’t use your sword unless there is a reason to. 5. Have the girls practice these skills – avoiding slashing, more thrusting, and remembering the “things to avoid.” You may want to remind them to try to maintain all the things they learned in Part 1, too! You may also want to rotate every few minutes to give them new opponents. If you have extra time you can also have them practice feinting – pretending to attack in one direction and then switching to another direction.